Built in 1806 in the Regency style, the Vicarage faces onto Coldwell Street. To the left is the Baptist Church, over the roof in the distance is the spire of Wirksworth Parish Church (St Mary the Virgin). The rear gardens of the Vicarage back onto Church Walk, which surrounds St Mary's like a cathedral close. See the Street map. 1841, 1851, 1861, 1871, 1881 and 1891. The author remembers visiting the vicarage in 1995 to see Rev. 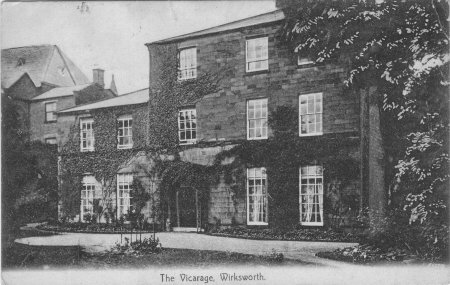 Robert Caney to ask for his signature to allow the transcribing of the Wirksworth Parish Registers from IGI microfilm. He showed great interest in the project, which was completed in 1998 and can now be found under Parish Registers on this website. My thanks to Rev.Caney. Source:by "James Watterson, Photographer, Wirksworth"